First, we have a new family member joining us in February. His name is Ciro and he’s my daughter’s dog. 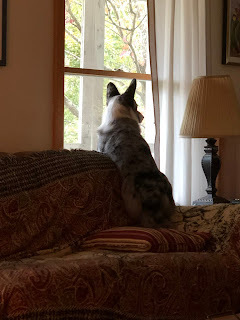 He’s learning a lot of things between now and then, and we get to visit him every week. Here he’s showing off his sit. The gardens are beginning to fade a bit. 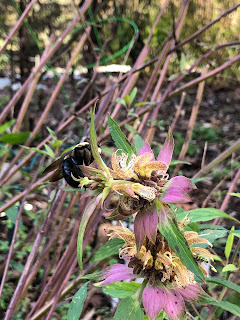 This is the very last horsemint bloom with a carpenter bee taking full advantage. I cut the horsemint back recently as it was getting damp and powdery mildew was trying to set in, and beneath the huge mound was this late bloomer. I was away for a week writing at my beloved Porches, where color was a bit ahead of ours on November Hill. It was a fabulous five days and I got a lot of work done. Back home in Poplar Folly, the newly-titled Prince of Poplar shows off his throne. 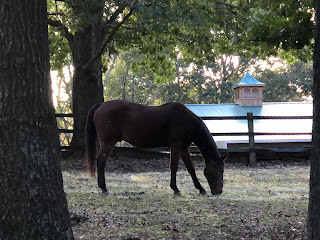 Keil Bay’s ACTH came back at 68.5, so the vet has prescribed Prascend and since we’re at the end of the seasonal rise and his number is not sky-high, I’ve consulted with my homeopathic vet and will be using a protocol of two remedies between now and January. We’ll redo the test, see where his level is, and proceed from there. I have the Prascend ready if we need to do a slow tapering on of that medication. The good news is, it’s early PPID if at all, so hopefully he won’t ever experience a negative symptom beyond the mild skin infections he had this summer. 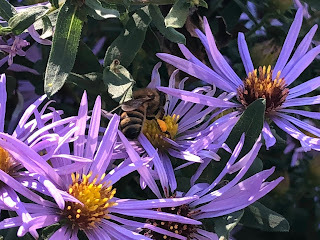 The asters are going completely nuts and a few days ago I spotted the first honey bees I’ve seen this year. The asters were covered in honey bees! Check out her pollen basket! 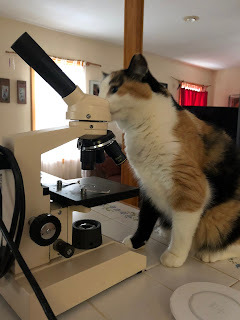 Meanwhile, inside, Pixie proves once and for all that girls LOVE science. And the Prince of Poplar keeps his eye on the kingdom from his front window perch. I rely on him to let me know if I need to check anything out. Overall, it’s a beautiful time here. 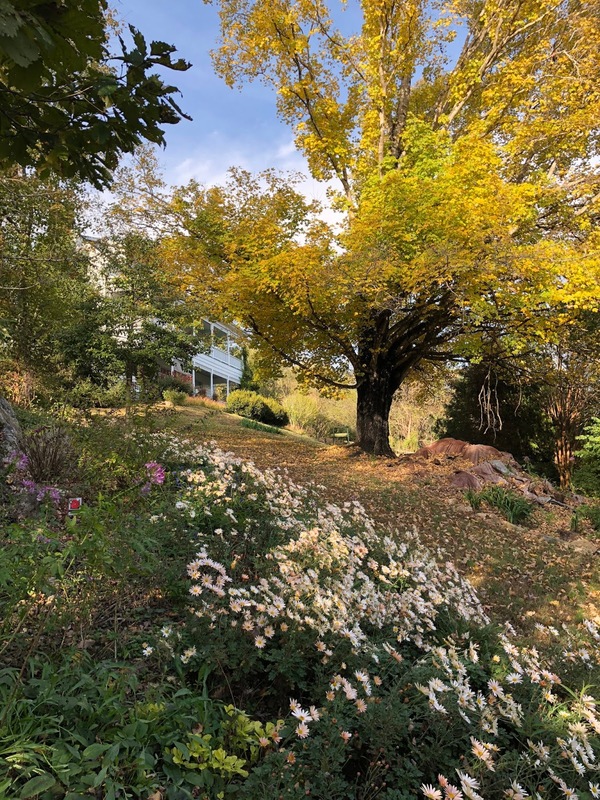 The dogwoods are peaking in color and the oaks are starting to change now. The leaves are falling and temps are dropping and projects are slowly moving forward. Right now I’m still finishing up what’s already on my plate. Not planning anything new for the rest of this year. This Monday the barn is getting a thorough cleaning inside and we’ll be making a few small repairs to get it ready for the winter months. I have a couple of already-in-progress projects that we’ll finish up and enjoy. The main project is to enjoy November and this amazing herd! Glad you got some writing done. It's a pretty place to be. Love the doggie in the window and on the tree, he's so cute. 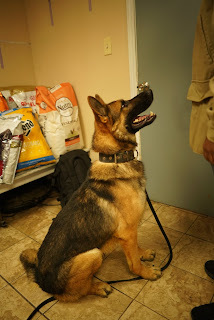 A very handsome German Shepherd too. Looks a little like my Nikita to me. I'll be interested to see how the holistic approach works for Keil Bay. 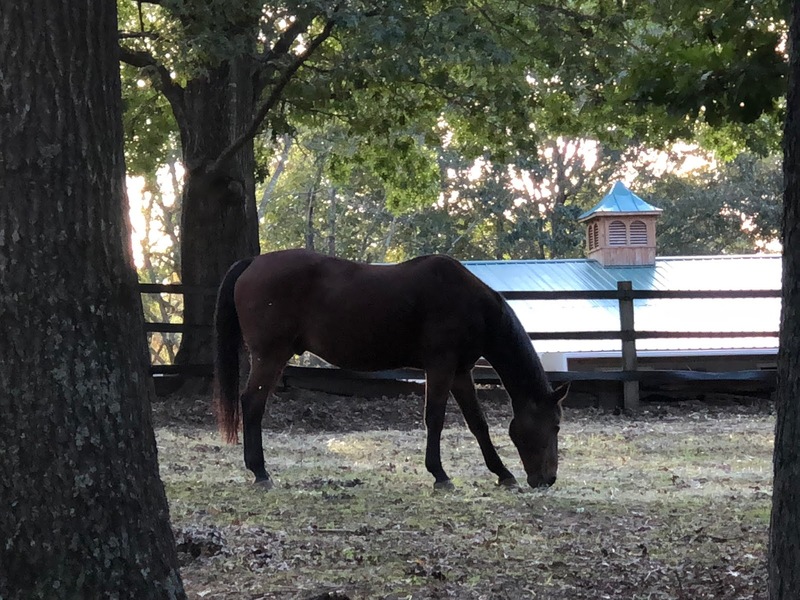 Enjoy the herd in November on November Hill! Everything looks beautiful. I love the Autumn colors. Thanks - I love Porches so much. It feels like home but without any responsibilities except writing and feeding myself! 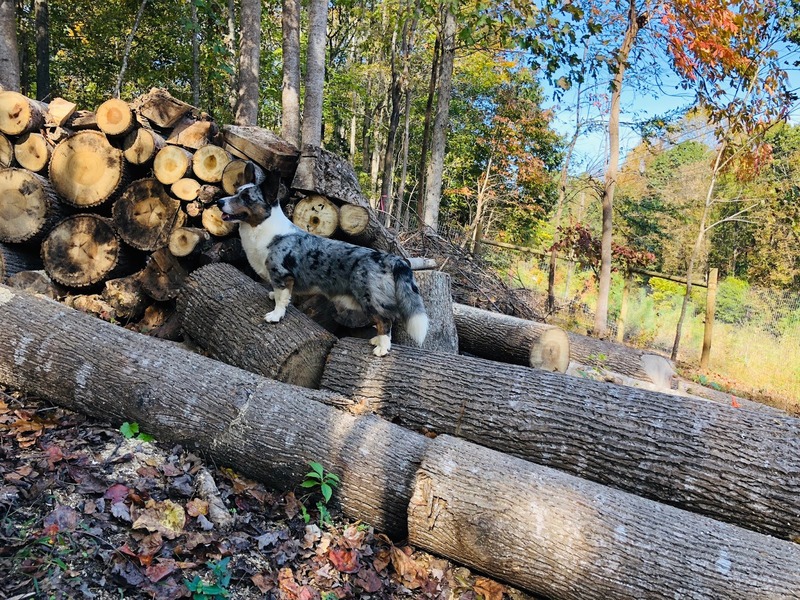 Baloo is a trip - always on the look out and always posing in some way. How’s Nikita doing? I thought of her when we found Ciro, who is 2 1/2 and huge. It’s going to be an adjustment to have an animal of that size in the house!! I’ll definitely report back on Keil’s treatment plan and how it goes. I am LOVING this season. So far we’re having very nice days and cool but not below freezing nights and it’s the very best weather for being outside. Hope all is well with you and all your crew! 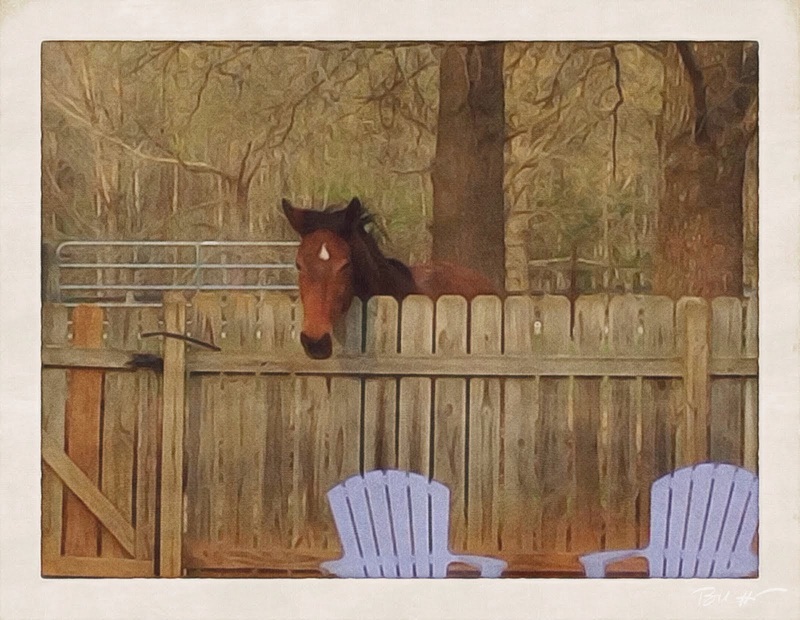 I know you are seeing gorgeous color on your lovely farm! Nikita is doing well. She’ll be 3 on November 6. I’m planning a post on her. The colors here were beautiful until today, we had a huge rain storm with wind and all the leaves are down. We’ve had lots of rain lately. But I’m liking the cooler temps. Oh, can’t wait for your post on Nikita! Happy birthday to her! We had rain last week and again Monday, I think, but not enough nor wind enough to take all the leaves down. The color is popping now, with some trees literally changing overnight! Wonderful pictures, still smiling about the biologist Pixie!